Entrepreneur Brian Goldberg '99 serves up a cross-cultural food sensation on the streets of New York. 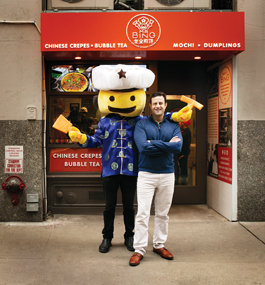 FUN FOOD: Brian Goldberg '99 with the Mr. Bing mascot outside the Chinese creperie's first brick-and-mortar location. On a sunny morning, tourists are crowding into New York City’s Times Square to take selfies with costumed characters and snag discount Broadway tickets. And, even at 11 a.m., a line is snaking along the sidewalk near Mr. Bing, a food stand in the middle of the pedestrian plaza. 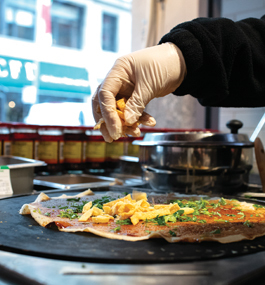 Mr. Bing serves jianbing — “bing” for short — a savory egg-coated pancake wildly popular in northern China. An Asian couple sits down to share a traditional bing with vegetables. A family from Spain enjoys a sweeter version oozing with Nutella. 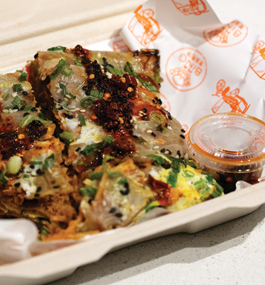 One woman wanders over to observe the cook, who ladles a thin layer of mung bean, crispy chili paste, rice and wheat flour batter onto a cast-iron griddle, followed by a layer of eggs, crispy wontons and a sesame scallion hoisin sauce. “What is it?” she asks. The woman laughs and orders an $11 bing filled with Peking duck. That’s the goal, says Goldberg — introduce a street food from the Far East to Americans, one customer at a time. “If you can make bings famous in America, you’ve got a pretty good career ahead of you,” he says. With that, Goldberg digs into his own steaming vegetarian bing with a side order of dumplings. He fell in love with bings while studying in Beijing as an undergraduate, sometimes eating them for every meal. He’s always thought Americans would feel the same way once they tried them, and — if Mr. Bing’s slow, steady success is any indication — he’s right. Now Mr. Bing has four locations in Manhattan, including a stall at the trendy Urbanspace@Vanderbilt food hall near Grand Central Terminal and the chain’s first brick-and-mortar restaurant, in the Chelsea neighborhood. Goldberg says the business is on track to bring in approximately $3 million in sales in 2018. Goldberg’s path to entrepreneurship has been an unusual one. 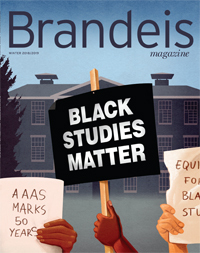 Raised in Spring Valley, New York, about 40 minutes north of Manhattan, he earned a scholarship to Brandeis, where he played on the golf team and planned to become a doctor. As a sophomore, he was accepted into an early-decision program that both guaranteed entrance to Tufts University’s medical school and encouraged undergraduates to pursue nonmedical interests before graduation. After spending a summer studying Mandarin in California and developing a fascination with Chinese cinema, Goldberg made a U-turn, ditching pre-med and deciding to major in Chinese studies. He spent part of his senior year in China and discovered jianbings. He shelved the plan, however, to chase another dream: competing as an Olympic luge racer. Goldberg, who grew up skiing, tried out for the U.S. luge team at 17. Though he didn’t make it, he showed enough promise that the team’s trainers urged him to keep in touch. After Brandeis, he trained in Japan with the International Luge Federation while simultaneously taking classes at Columbia. Goldberg eventually made it to the World Cup circuit, raced in two World Championships and qualified for the 2002 Winter Olympics in Salt Lake City. He was going to represent Israel as a dual citizen. “I was the Israeli team,” he says. “No Israeli had ever done luge before.” But he got cut when Israel, citing post-9/11 security concerns, decided to send a smaller delegation. “It was incredibly disappointing,” Goldberg says. Nevertheless, the experience led to his next career step. When NBC did a segment on Goldberg in the run-up to the Winter Games, he was introduced to the behind-the-scenes world of TV news. He worked for a year at NBC in New York as a page before his fluency in Mandarin helped him land a job as an assistant producer in Singapore. After three years as a producer and reporter at CNBC and Channel NewsAsia, he realized, he says, that “I was having a lot of fun but not making a lot of money.” Friends in finance suggested he try investment banking, and Goldberg spent the next nine years in Taiwan and Hong Kong as an Asian equity sales trader for Sydney-based Macquarie, Paris based Société Générale and other multinationals. Then a weekend getaway to Beijing rekindled the idea for Mr. Bing. “I had jianbing on the street again,” he says, “and all those memories came flooding back.” He’d also just read Howard Schultz’s book about guiding the Starbucks phenomenon as well as Ray Kroc’s tome on the founding of McDonald’s. Using his own savings and funds raised from friends, he set out to open a small restaurant in Hong Kong and in 2012 began making trips to Beijing to meet with dozens of street vendors. He convinced one he calls Master Ban to sell him her recipes and brought her to Hong Kong to teach his staff her techniques. Still, Goldberg had faith the jianbing concept would take off in America. After 14 years abroad, it was time to come home. He sold his Hong Kong apartment and moved to Manhattan’s Upper East Side. Traveling the country to research culinary trends, he saw that food trucks and upscale food halls were growing in popularity, and had lower overhead costs than a conventional restaurant. Goldberg believed this might be the way to move Mr. Bing forward. “It’s food-cart food by nature, right? Everything just started clicking and making sense,” he says. A big break came in November 2015 when Goldberg pitched jianbings to the operators of the Urbanspace@Vanderbilt food hall, which had opened just a few months earlier. They asked for a cooking demonstration the next day; he rushed to Chinatown to buy ingredients and a crepe machine. The bings were a hit. Goldberg was offered a spot at an outdoor holiday market Urbanspace planned to open the following week. In the three years since, Goldberg has put about $300,000 of his own money into Mr. Bing, with additional help coming from small-business loans and institutional investors. The aim is to move the company beyond individual food halls and standalone kiosks into transit stations and airports. “Places where you’re on the go,” he explains. Once the chain is firmly established in New York, he hopes to expand to Philadelphia; Boston; Washington, D.C.; and other East Coast cities, and sees more opportunity down the road in California and in international hubs like London and Tokyo. Heather Salerno is a freelance writer who lives in the Greater New York City area.